A quick look at the board reveals the main electronic parts used: CH341A, a 12 MHz crystal required by the chip, a 3.3V regulator, two 7 pin headers and the ZIF (zero insertion force) socket. The programmer can be bought with additional sockets and adapters, some of them with voltage shifting circuits. 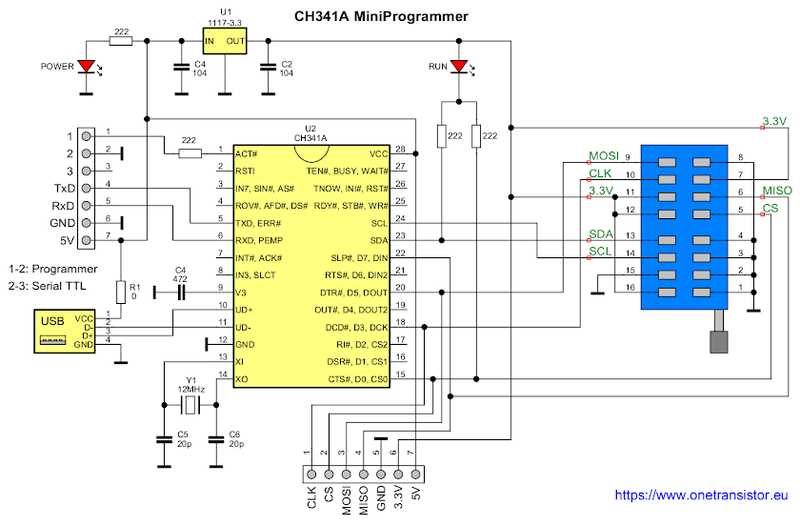 After some searching I found a schematic of a CH341A based programmer, but it wasn't exactly right and complete. It didn't have the pinheaders on the sides of the ZIF socket which I wanted to know what they are for. I took the multimeter and started to trace lines on the programmer PCB until I got a complete schematic. The schematic is quite simple, based on datasheet. I also found WAVGAT store (a seller on AliExpress). 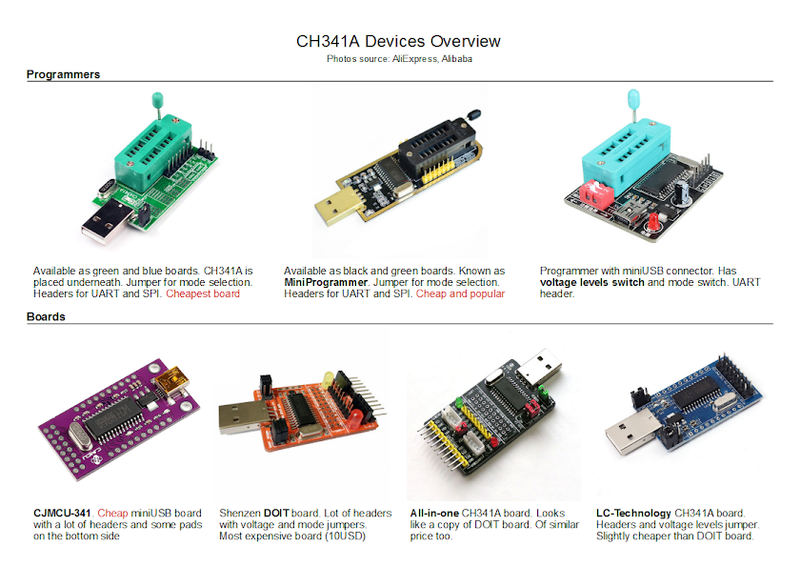 Their product page offered a the PCB design of the device (only top side, however). Now, let's return to the schematic and analyze it a bit. The chip is powered from 5V, so its I/O ports will also use 5V. Basically this is a 5V device. The problem is that any memory you fit in the socket will be powered from 3.3V. And this seems to be the only function of the 3.3V regulator (besides the 3.3V pin on the SPI connector). I don't know why the designer even used a regulator, if it didn't provide a switch to choose between 3.3V or 5V levels and supply. By reading the datasheet, we can see that the manufacturer recommended to connect a 0.47 uF capacitor between RSTI (pin 2) and VCC for improved stability. There is none on this board. Anyway, I used the device with I2C EEPROMS (3.3V and 5V) compatible and also SPI FLASH memories (3.3V devices) without any issues. For improved reliability and to avoid burning memory chips, I highly recommend using a level shifter. In order to turn this programmer into a 3.3V device, you could cut the 5V line from VCC pin (28) and tie it to the 3.3V output from regulator. You will also need to connect V3 pin (9) to VCC (3.3V). User johnmx from EEVblog Forum has succeeded in converting this programmer to 3.3V levels. Note that the device works as a programmer only if ACT# pin is connected to ground via a resistor. That's why you should put a jumper across pins 1 and 2 of the UART connector. 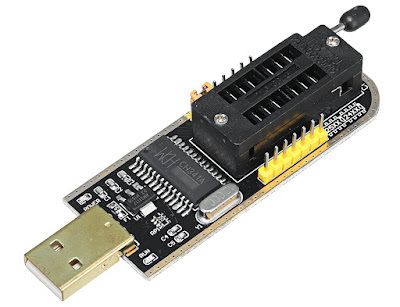 Otherwise the device will be recognized as a standard USB to serial converter. CH341SER.EXE - self installing archive with USB to serial driver. CH341PAR.ZIP - archive containing driver files for interface mode and API (header and library to access the device and use any protocol you want). CH341DP.ZIP - contains an ISP programming tool? A regular user only needs the first two. Just double click on each of them and when the dialog appears click on Install. Next thing you'll need is software. Windows users can try AsProgrammer. Further reading (for developers): I2C Programming and SPI Programming using Windows API. Great job. thanks for taking the time to share the information. I got the software installed, switched it to English from Chinese, and loaded the drivers. I still could not program a 24C32 EEPROM. After some board level troubleshooting I found that pins 1,2,3,4 and 15 were not connected to anything! That said, there was no chip ground and no connections to the 24C32 address lines. One other pin, socket pin 15, (EEPROM chip pin 7) was not grounded. that is the read/write line. After adding several jumpers to ground the programmer worked. the 470nF capacitor should not be between VCC and RSTI, as you say, but between V3(pin9) and ground where is, as the datasheet I found says, and shoud be between 10nF to 470nF. My bad, indeed for stability there should be an another capacitor as you wrote. I have one of these arriving to programme some 24Cxx devices. I don't think the 3.3/5.0 volt issue is a problem here because the SDA and SCL voltages are derived from pull up resistors. So 3.3v devices should not be stressed. However if the pull ups are powered from 3.3v via a LED I doubt the 24Cxx specs are being adhered to - ADA and SCL will only go to less than 2V ???? That was a difficult question. I took the multimeter and measured (again) the voltages on the idle I2C bus. 4.9 volts... I unplugged the programmer and tried to measure resistance between I2C bus pins and power line (3.3V and 5V). Nothing conclusive. So I returned to datasheet. Here is what it says in the Chinese PDF at page 3, section 4.2, pin 24 of 341A (translated with Google): "Chip function configuration output, built-in pull-up resistor, can be connected to the serial EEPROM configuration chip SCL pin". The pull-ups are therefore built-in. And look at the schematic again: only SDA is connected to the LED. What would be pulling SCL up if it weren't the built-in resistors? The CH341 chip supports a 5V supply voltage or a 3.3V supply voltage. When using a 5V supply voltage, the VCC pin of the CH341 chip inputs an external 5V power supply, and the V3 pin should be externally connected with a power supply decoupling capacitor of 0.01uF to 0.1uF. When working with 3.3V voltage, the V3 pin of the CH341 chip should be connected to the VCC pin, and an external 3.3V power supply is input, and the CH341 core is connected. The operating voltage of other circuits connected to the chip cannot exceed 3.3V. As far as I understand, that mean, that chip have internal 3.3V regulator and IO pins are NOT 5V tolerant. It mean, it always use 3V3 for communication with eeprom. "The operating voltage of other circuits connected to the chip cannot exceed 3.3V" when CH341A is powered from 3.3V. Otherwise, I/O pins use 5V when chip is supplied with 5V. There is no mention of an internal regulator in datasheet. I need a recommendation for a capable and quality device that you consider better than the CH341A that can do everything the CH341A does (and more) that I may be able to get for under $75.00 US. Another question would be, can a EZP2010 do everything that a CH341A does (and more)? Are they any more capable/better quality or just the same? It's very hard to evaluate this stuff because I'm just looking at pictures and have no idea of the reputation in the community for any of these. I don't want to waste my time with something that is junk.